The best way to get to know a community is by scheduling a tour. See the facilities, meet the staff and residents, and get a feel first hand what it's like to live at The Cottages at Woodland Terrace Independent Living. An exclusive community for active Georgia seniors, The Cottages at Woodland Terrace offers the retirement experience you've planned for all your life. We are centrally located in beautiful Milledgeville, just minutes away from shopping, dining, entertainment, medical facilities, three colleges, several golf courses and Lake Sinclair. The Cottages at Woodland Terrace is proud to be a Cottage Lifestyle senior living community. Developed by Double Eagle Associates, one of Georgia's premier builders of luxury retirement communities, Cottage Lifestyle communities specialize in meeting the unique needs of seniors from no-step entries to gated-access neighborhoods. Our charming, single-story patio homes are available for both purchase and lease. Choose from spacious one- or two-bedroom floor plans that feature an attached one-car garage, nine-foot ceilings with crown molding, custom oak cabinetry and all modern appliances including a built-in microwave and washer/dryer set. Small pets under 25lbs are welcome to join you at The Cottages at Woodland Terrace, and many a cat and dog have enjoyed napping peacefully in the sunroom that comes attached to every home. Furry friends will also appreciate taking walks around the neighborhood amongst our well-lit, landscaped grounds. To enhance life at our community, we schedule a dynamic calendar of fun events and activities. Join your friends and neighbors for a rousing game of Bridge, Bingo or cards, or showcase your favorite recipe at one of our popular covered dish gatherings. 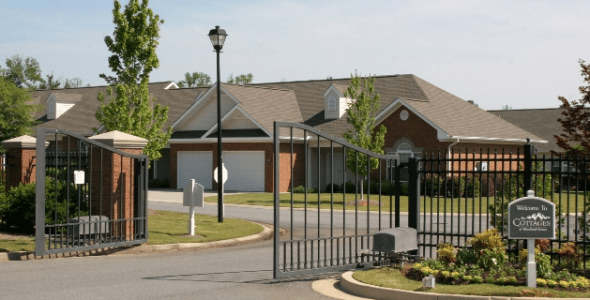 For your added comfort and peace of mind, we provide gated entry. We also have a monitored security system with daily check ins, home maintenance and landscaping services that are included with your monthly lease. Life couldn't be better at The Cottages at Woodland Terrace, Milledgeville's premier luxury retirement community.